I have no idea how many times I have started reading the Thorn Birds. But then every time I stopped reading, not even half way through the book, for various reasons. 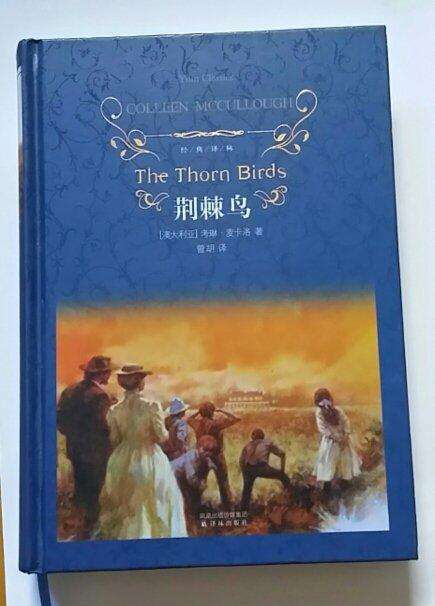 The renowned book is written by Colleen Mccullough (1937~2015). According to Wikipedia, “the novel is the best selling book in Australian history, and has sold over 33 million copies worldwide.” The book revolves around the love story between Meggie Cleary, a red haired Australian girl and Ralph de Bricassart, a priest, as well as about the struggle for life of the Cleary family, in early 20th century. There’re not a lot of English books I had read. The Thorn Birds is definitely one. The moment I started reading I was deeply attracted to it. To give up reading such a lovely classic is a sin, I’d say. Well I did, and the reason for that is that I loved it too much so I had to stop. I know it sounds confusing. Here’s why. The first time I read it, I found it fascinating, I kept on reading and neglected all those new words that were strange to me in the context. I was so eager to know the development of the story and what happened next that I never bothered to look up the new words in a dictionary. Then after finishing the first chapter, I stopped. I realized that the way I was reading was so wrong. How could I treat this classic in such a rough way? The use of the words, the adjectives, the thoughts… the author must have pondered again and again before finalizing them, and somehow I just searched for the main story line, rather than caring a little about the beautiful descriptions and the exploration into the characters’ inner selves. “No I can’t let such a precious book go waste like that. “ I told myself. So I forced myself to stop the reading, for the 1st time. I was going to re-start to read it again, officially, by understanding each every word the author had written, I decided. Next, I became fully occupied by my work and other matters in life. When I opened the book again, it was several months later. Good thing that I had the electronic version of the book installed in my cellphone so I could carry it with me and use the fragmentary time (碎片时间) to read whenever I had time. Another benefit of having the book stored in a cellphone is that looking a word up in an electronic dictionary also stored in my cellphone was very a very convenient way to learn. This time, I not only looked each new word up, I also highlighted them in the text. How badly I hoped to comprehend every word in this book. Unfortunately I became too busy with my work again and had no choice but to put aside the book. Frustrating and tedious work overwhelmed me almost every day. No time and no mood for leisure. and it wasn’t the best time to read it. Didn’t want to spoil the book. So when I open it up again, it was another couple months later. And then I became so upset about myself. Because I found I’ve lost the memory about almost all the words that I had looked up in the dictionary and highlighted in the text. Without hesitation, I started the reading afresh. Yes, from page one, because I wanted to make sure I didn’t miss out a single word. This is the third time I started reading the same book. So I kept reading. And then 2018 had come to an end. For the first time in my life, I set a few goals for myself to achieve in 2019. One of them is to pick up my translation skills again and hopefully I can find another weekend part-time job as a translator, despite my busy full-time job. Then I had an idea. Why not try translate this book while I read it? So I can enjoy reading the story and at the same time practicing my translation skills. Once decided, I bought a Chinese version of the book online, and used it as a textbook to correct my own translation. I didn’t want to start half way, I started the book all over again, for the fourth time. Right now I’ve restarted for the 4th time, and I’m holding on to it. Hopefully there won’t have to be a 5th time… O well, here comes another item on my To Do List in 2019: finish reading the Thorn Birds. Nice story of your share. Reading does give us inspiration and we learn a lot from books. It helps us know better the world and ourselves. The original version is not something that everybody can read smoothly. We are not natives, it is sort of hard to finish. As you said, so many words we do not meet before, and the background of story happened in the special age, etc. To understand better from a book, there is a lot things we should do. Anyway, you overcome difficultifies by finally finishing it. A good book is worthy of reading for many times. Congratulations. Next step, as you have planned, you really can try translate something as you want and like. You learn words and stories from books and you do the translation at the same time. The Thorn Birds is a good work. I do read many books something like that. Those original versions are really bringing me into another new land where I can find new things in a different world. I assume you are good at English since your words are comfortable to read. You now start another new life in the new year. Yes you are right that these classics are like new land laying there for us to explore. They are where I escape to from my heavy workload. First working day in 2019 is pretty harsh , well, time to do some reading...and happy new year to you! You can handle it, just come on. You have to trust yourself that you can do it well. Both work and life you can totally deal with them on your own, though sometimes it is not that easy, but I think it is just that meaning we are supposed to be right there. Thank you so much for your encouragement. Yes you are right, though it's not easy sometimes, but we need to just face it head on!